A little bag with a big punch. 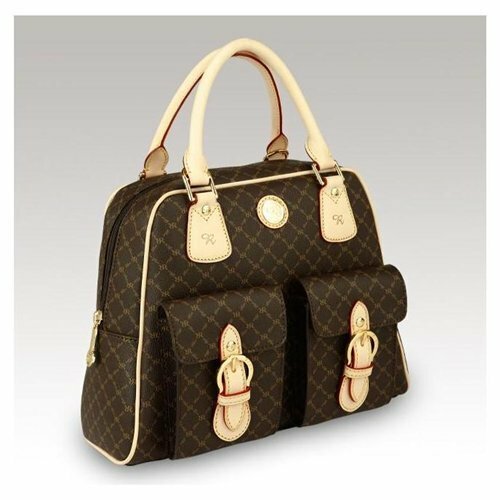 Gentle dark gold ''RR'' RIONI monogram print on solid brown Italian canvas body accented with Italian dual-looped leather handles and trim. Embossed gold RIONI Moda Italia emblem. Two front decorative flap pockets with magnetic clasps. Rear zipper pocket. Zipper opening entrance. Goldenrod fabric RIONI monogram print lining. Interior pouch pocket and zipper pocket. Detachable shoulder strap included. Rioni is a trademark & rigistered Italian brand. Qualities are its superior craftsmanship. If you have any questions about this product by Rioni Signature, contact us by completing and submitting the form below. If you are looking for a specif part number, please include it with your message.